What should a presentation tell? 1: Have one main message to pass. No more, no less :). 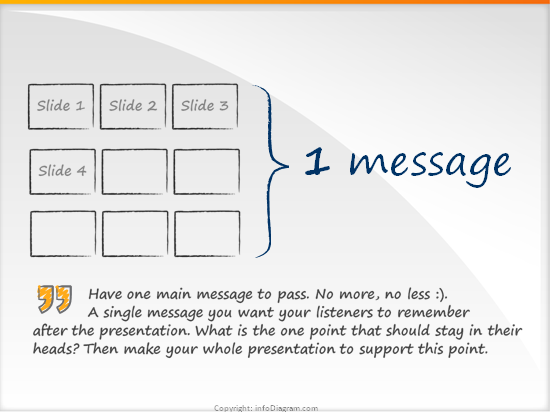 A single message you want your listeners to remember after the presentation. Think it over, what is the one point that should stay in their heads. Then make your whole presentation to support this point. A + B + C: Present three arguments supporting your main message. Three reasons why your message is important to your listeners. Enrich each argument by giving examples, stories, facts. Why three arguments? Because remembering three points is easy for all of us. Three key points have a strong impact. Adding more key points will make them weaker and they will not be any more the “KEY” points. You risk that your listeners will lose a track. Structure of presentation, represented by a sequence of slides: I chose to show the whole presentation from bird view, to underline ‘What’s a big picture’ idea. Showing it as a long line of slides didn’t look good – it didn’t fit on the screen on one side 🙂 and when looking at last slide, you lost view on the first slide. So it was better to “break the lines”, and show it as more compact shape. Illustrating one message that all elements should support – I have chosen the curly brackets because it nicely fit the empty space on right side. Eventually, I could make a big marker circle around the slides. It's the first time i ran through your site and I found about sales training from it very informative and interesting. Nicely done!